Andrew Philip Schumacher was born in Crowley, Louisiana, May 5, 1989. A 2008 graduate of Notre Dame High School, Andrew Schumacher was not voted “most likely to become a priest” by his classmates, but was crowned “Homecoming King” his senior year. Active in Student Council and on the basketball, football, and tennis teams, Andrew would not recognize his calling to serve the Church until a few years later while attending the University of Louisiana - Lafayette. After earning a Bachelor Degree in Business Finance and serving as the President of Kappa Sigma Fraternity, Andrew went on to St. Joseph Seminary College in St. Benedict, LA where he earned a Bachelor of Arts in Philosophy. He recently graduated from Notre Dame Seminary in New Orleans with a Masters of Divinity. Fr. Schumacher was ordained a priest for the Diocese of Lafayette by Bishop Deshotel on June 23, 2018. 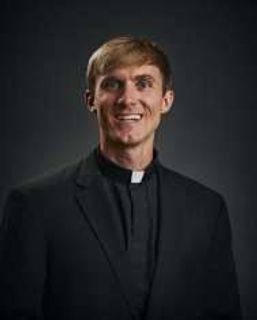 After ordination he was appointed as the parochial vicar of the Cathedral of St. John the Evangelist in Lafayette.